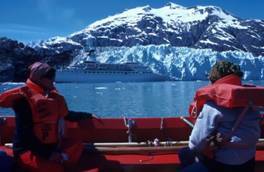 Alaska Cruises & Vacations offer Exciting and Unique Tourist Activities. A Wilderness Vacation Cruise in Alaska encompasses an abundance of wildlife and a breathtaking landscape of unsurpassed beauty. Wildlife – This remote wilderness contains one of the largest North American wildlife populations, including many rare and endangered creatures. You may see huge grizzly bears, orcas, blue whales or humpback whales, impressive polar bears, majestic bald eagles, as well as lynx, moose or wolves. Shopping – Look for the Made in Alaska logo on beautiful handmade items such as woven beach or bark baskets, miniature hand carved totem poles, beaded mittens, seal oil candles, unique gold nugget jewelry, hand carved jade and ivory decorative items. Don’t forget to bring back some delicious wild berry products, canned and smoked salmon and reindeer sausage! Fishing – With more than 3,000 rivers and 3 million lakes, Alaska offers some of the best fly-fishing, saltwater, freshwater and ice fishing in the entire world. You can charter a plane and spend a day enjoying the gorgeous scenery and trying to reel in one of the area’s 627 fish species. Another option is to book a luxury week-long fishing trip complete with fine wine and fresh prepared gourmet meals. Cruises – If you’re visiting Alaska, be sure to include an ocean cruise. You can see everything from puffins and whales to impressive icebergs. Some popular day cruises include Resurrection Bay, Prince William Sound, Glacier Bay and the Kenai Fjords. You can enjoy a gourmet meal and glass of wine while searching for wildlife and taking in the remarkable scenery. 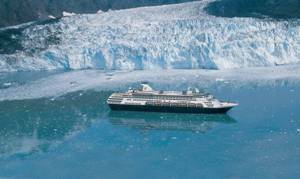 You have a wide choice of cruise lines that travel to Alaska year round. This remote area of the world has always been a popular cruising destination. Some of the cruise lines include the intimate America Safari Cruises, Clipper Cruise Line, informal Cruise West and Lindblad Expeditions, family-friendly Royal Caribbean Cruise Line, the casual Norwegian Cruise Line, luxurious Celebrity Cruises, and the Regent Seven Seas,, elegant Holland America, renowned Princess Cruise Line, all-inclusive luxury Silverseas Cruises and, the eco-friendly Clipper Cruise Line. You can choose a 3, 7, 8, 12 or 15-day cruises that include a wide variety of captivating ports, depending on your schedule. There are prices to suit everyone’s budget and you decide whether to visit Alaska on a small cruise ship holding as few as 12 guests or a large luxury liner with more than 3,000 other passengers. Land Tours – Many tour companies enable tourists to explore the breathtaking beauty and abundant wildlife of the 6-million-acre Denali Park or Fairbanks – the Golden Heart of Alaska where you can visit the frontier theme park, Alaskaland Pioneer Park, the El Dorado Gold Mine or the University of Alaska Fairbanks. You can also experience an exciting visual concert of the northern lights at Photosymphony Productions or enjoy a relaxing Sternwheeler Riverboat Discovery tour. If you want to experience the Inupiat Eskimo way of life or the remarkable Arctic landscape, be sure to take advantage of the scheduled visit to the town of Kotzebue. Located 30 miles above the Arctic Circle, Kotzebue invites visitors to explore the Innaigvik Education and Information Center. Prudhoe Bay is an even more remote Alaskan destination. Located 250 miles north of the Arctic Circle, the bay is home to North America’s largest oil field. The area also contains a large variety of wildlife, including polar bears, caribou, arctic foxes, musk ox, arctic hares, arctic ground squirrels, brown bears, grizzly bears, and 200 bird species. Talkeetna is another great Alaskan destination known as the gateway to Denali National Park. You can prepare for a climb to majestic Mt. McKinley, enjoy trout and salmon fishing, relax on a river raft float trip or enjoy the beautiful tundra, wildflower meadows, glaciers, mountains, and forests of the vast park. Wildlife Tours – Many companies offer grizzly bear tours, wildlife viewing excursions, bird watching tours or whale watching trips. You can choose a guided hiking tour through the coastal rainforests of the Inside Passage to watch for wolves, bears or deer, a kayak tour to spot sea lions, otters and killer whales or a boat tour of Tracy Arm where you can marvel at mountain goats and puffins. Alaska’s Icy Strait is a popular summer feeding ground for majestic humpback whales. Kodiak Island, Katmai National Park, Brooks Falls and Admiralty Island are all great locations to spot grizzlies and brown bears. Alaskan Natives refer to the latter as “Fortress of the Bears” because of its huge bear population. Be sure to have your camera ready at all times! 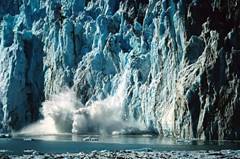 Glacier Tours – Alaska contains more than 100,000 glaciers. You can spend the day visiting the state’s largest tidewater glacier, the Columbia Glacier or explore the 300-mile Harding Icefield of Kenai Fjords National Park. You can also witness huge icebergs breaking off from 12 different glaciers before falling into the sea at the Glacier Bay National Park and Preserve. Gold Mine Tours – Spending a day reliving the gold rush experience is a fun and educational experience. You can take a gold mine tour of Porcupine, watch local miners demonstrate modern mining techniques at the El Dorado Gold Mine or pan for gold at the Crow Creek mine. Sled Dog Kennel Tours – Are you looking for a truly unique tour you won’t be able to find anywhere else? Try an exciting sled dog kennel tour of areas such as the Brooks Range, Nome or St. Michael! You’ll be greeted with spectacular scenery, learn all about the famous Iditarod dog race and get the chance to cuddle adorable husky puppies. Flight Tours – Flying is a great way to see the vast beauty of Alaska and the sky is really the limit when it comes to choice. You can take a helicopter tour with companies such as Coastal Helicopters. You’ll be rewarded with impressive sights such as majestic Mt. McKinley, the active volcanoes, Mt. Redoubt and Mt. Spurr and massive glaciers such as the Kahiltna Glacier. In fact, you may see up to 34 different glaciers in a 2-hour helicopter flight! For a truly unique experience, choose a flight tour that lands on the slopes of the Ruth Glacier. Many helicopter tours also travel to remote wilderness areas like the Gates of the Arctic National Park where you have a good chance of spotting Dall sheep, mountain goats or even a moose or two. If you prefer, you can enjoy a relaxing scenic ride in a floatplane to appreciate Alaska’s unique landscape and wildlife. Bicycle Tours – Cycling is a great way to explore the vast wilderness of the Alaskan landscape and enjoy the fresh unpolluted air. You can take a guided bicycle tour along miles of pristine Alaskan roads, enjoy a scenic cruise around Glacier Lake or rent a mountain bike and explore the popular wooded trails of Johnson Pass. Alaska offers everything from leisurely city tours to a challenging 360-mile Golden Circle historical route for the more adventurous cyclist. Boat Tours – With so many scenic waterways, exploring Alaska from the water is a great choice. Alaska has many state marine parks only accessible by boat. You can enjoy a very relaxing boat tour of the remote Alaskan wilderness, marvel at the massive icebergs and fjords from a kayak or take a lively dinner cruise. Another unique option is to relive the excitement of the gold rush and relax aboard a grand Alaskan sternwheeler; you can enjoy folklore, food and music as you explore the Tanana or Chena Rivers. City Tours – You can visit many of Alaska’s popular cities and towns via relaxing rail, exciting trolley, comfortable van, luxury motor coach or a charming horse and carriage. Spend the day exploring the governor’s mansion of Juneau, Alaska’s capital, a trolley tour of the Alaska Native Heritage Center in Anchorage or the University of Alaska Museum in historical Fairbanks. Fishing Boat Tours – Alaska offers some of the best fly fishing in the world. Many companies such as 56 Degrees North will gladly take you to scenic lakes teeming with numerous varieties of fish. You can try your luck at reeling in a fresh Sockeye Salmon, Rainbow Trout or Northern Pike or learn all about the history of Alaskan fisheries. Many Alaskan fishing tours include luxury fishing lodges and delicious prepared gourmet meals. Some of the more popular fishing destinations include Ketchikan in southeast Alaska, and Wood-Tikchik State Park in the Bristol Bay region. Rivers in the area contain some of the highest numbers of Rainbow Trout in the country and 3.5 million Sockeye Salmon! You can also spend an enjoyable day fishing at your leisure and relaxing in a riverside cabin on the Kenai River. Unique Tours – For a special experience, don’t miss the Mount Roberts Tramways. You will pass the rainforest of Southeast Alaska on your way to the 1800-foot summit of Mt. Roberts. One of the most spectacular views of the entire state awaits you. Other options include a classic car tour where you can explore totem poles, eagle’s nests or Native villages from a ’55 Chevy or an exciting amphibious tour where you can explore the best of Alaska from both land and water. Historical Towns – Alaska contains hundreds of interesting historical towns such as the historic gold rush town of Skagway and charming seaside community and former Russian capital of Sitka to the Ester Gold Camp ghost town. You can spend the day exploring the area, taking a city tour or visiting the local historical sites and cultural museums. You can witness Alaska’s unique Native culture with unique activities such as the blanket toss, music festivals, Native dancing spectacles and totem carving exhibits. Alaska Zoo – Spend the entire day exploring this 25-acre wooded area. You’ll get a chance to see 85 species of Arctic wildlife, from caribou, moose, glacier, grizzly and brown bears, wolves and musk oxen. The zoo also includes several international species such as a Siberian tiger, Bactrian camels and elephants. Alaska Raptor Center – This unique wildlife center contains raptors that are nursed back to health before being released back into the wild. Museums – There is certainly no shortage of historical and cultural museums to explore during your Alaskan vacation. You can visit everything from the Anchorage Museum of History & Art and the Inupiat Heritage Center to the Tribal Long House and Tom Pittman Geology & Mining Museum. Gold Mines – Alaska contains many gold mines and historical mining ghost towns. You can take a gold mining tour and watch miners in action. Why not attempt to strike it rich by panning for gold at the 3 state parks which allow recreational gold panning – Kenai State Park, Chugach State Park or Independence Mine State Historical Site! If you want to increase your chances of striking gold, be sure to purchase a map pointing out the popular local gold mining locations. National Parks Alaska is home to 15 of the world’s most impressive national parks. If you visit any of the state’s seventeen National Park System areas, you will be treated to unsurpassed natural beauty and a wide variety of wildlife. You can choose to visit the glacier-carved valleys of Kenai Fjords National Park, marvel at the rugged beauty of Lake Clark National Park and Preserve which covers 4 million acres or search for wildlife at the 6 million-acre Denali National Park. Alaska State Fair – If you plan to visit Alaska at the end of August, don’t miss this exciting state fair. You can listen to music concerts by top artists, explore the large “Made in Alaska” crafts and food court, watch the monster trucks, enjoy the carnival rides or watch the Cirque Equinox circus performers. At the end of the evening, you will be rewarded with an impressive fireworks display! ADVENTURE OPPORTUNITIES If you’re looking for adventure, you’re sure to find it in Alaska. It doesn’t matter whether you’re a thrill seeker or an avid outdoor enthusiast; this area has something for everyone. Because of the long days, you’ll have much more time to explore many of the exciting activities Alaska has to offer. Hiking Trails – Alaska’s comprehensive trail system is second to none. Throughout the entire state there are numerous trails suited for people of all fitness levels. You can hike, jog, cycle or walk through gentle meandering nature paths or challenge yourself by attempting the one-month mountaineering expedition to the summit of Mt. McKinley, North America’s highest mountain. River Rafting – If you crave excitement, don’t pass up the opportunity to try river rafting the Nenana River near Denali National Park. You can choose anything from a one-hour to full day tour. Another unique option is to taking a rafting excursion on lakes containing large ice chunks from surrounding glaciers. Professional guides will take you right up to these impressive icebergs, providing you with spectacular photo opportunities. Kayaking & Boating – Alaska has many lakes, rivers and streams, making boating a great choice. You can also kayak almost every one of area’s coastal towns. You can rent a sea kayak and explore hidden coves of the untamed Aleutians, spend a relaxing day fishing for world-class salmon or enjoy Alaska’s breathtaking scenery from a canoe. Be sure to watch out for seals, otters, sea lions and whales during your outings.